Instant Family is a personal film from filmmaker Sean Anders about a couple who is fostering to adopt three kids. It's surprising in that it doesn't rely on silly comedic sequences, but rather true emotional and heartwarming moments between the characters. In fact, this is a personal film to me as well, since I went through the adoption process at one point in time and I can say that Anders did a great job in showing a ton of wonderful realistic and heart-breaking moments that go along with the adoption process. The 1080p HD transfer is great and the dialogue-driven DTS-HD MA 7.1 audio mix gets the job done. There is a treasure trove of great bonus features too, making this a Highly Recommended release. Instant Family is one of those instances where the trailer for the movie suggests something that is completely different than what you get. In the trailer, the film looks to be a silly comedy about parents who foster to adopt three kids. Luckily for us, that's not exactly the case as filmmaker Sean Anders has added quite a bit of heart and emotion to this charming tale, while also showing a ton of realistic aspects of the adoption process, most of which are not happy-go-lucky times. Personally, in my life, I actually went through this adoption process, so I was excited and perhaps a bit skeptical to see these certain aspects in a comedic film. With all of the emotions and hardships that come with adoption, Anders rightfully and elegantly showcased them throughout the film and not in a silly way either. Instant Family is a mix of heartfelt scenarios along with some laughable moments, which are true in any new family. I was pleasantly satisfied with the result. Mark Wahlberg and Rose Byrne play a happy couple, Pete and Ellie Wagner, who has a loving and fun relationship, but they are unable to have kids. Ellie wants to adopt where Pete has second thoughts about that, as he is busy with his restoration business, along with restoring his own home, which is some good subtle symbolism with a new family. The happy couple decides to go through the hellish adoption process with the help of two social workers (Octavia Spencer and Tig Notaro), along with several other couples with insane quirks that bring a big element of comedy to the film. Eventually, Pete and Ellie adopt three siblings -- the rebellious teenage girl Lizzie, the pre-teen son Juan, and the youngest girl Lita -- who have been in foster care for a while, bouncing from home to home, because their mother is a severe drug addict. After this, we see that life isn't as easy as it looks for the new Wagner family as both sides of life intersect with different likes and dislikes, including some funny moments during Christmas, and eating chips at the dinner table. As the film goes on, the predictability rises, but it's not necessarily a bad thing. You want to see this family succeed as they certainly do, but with how Anders tell this personal story of his, the feelings and emotions are justified and natural. The performances from the three kids are endearing and Wahlberg and Byrne turn in realistic performances as well. Instant Family is a great and unexpected film that warms the heart and soul and also provides some laughs and maybe a small tear or two. 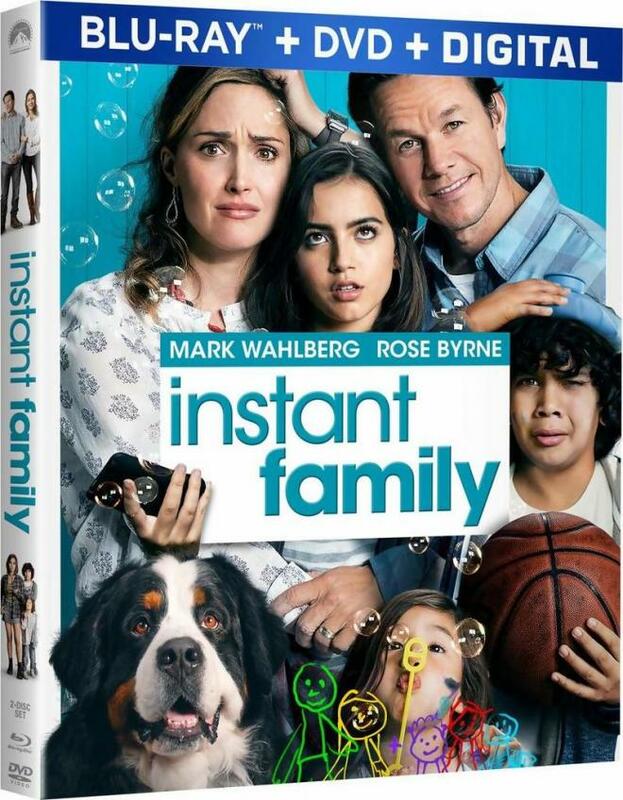 Instant Family comes with a Blu-ray Disc, DVD, and Digital Copy. The discs are housed in a hard, blue, plastic case with a cardboard sleeve. Instant Family boasts a good 1080p HD transfer with a 2.40:1 aspect ratio. This is a sleek looking HD image; however, it's not filmic. Colors are bright and bold with great primary colors throughout each interior space. The ongoing renovation of the Wagner home showcases a lot of differently textured whites, beiges, and browns, but when the kids are fostered, their bright primary colors make everything pop. Exterior shots of green grass and blue skies also look great here too. Black levels are deep and rich and do not bleed over in nighttime sequences and the skin tones are perfectly natural. Detail is sharp and vivid in each scene with perfect facial features, such as makeup blemishes, individual hairs, wrinkles, facial lines, and more on the actor's faces that show up nicely and easily. Clothing textures are wonderful in both close-ups and wider shots, making each setting and location looking realistic. There are a few spots where some video noise pops up, but it isn't much, leaving this video presentation with solid marks. 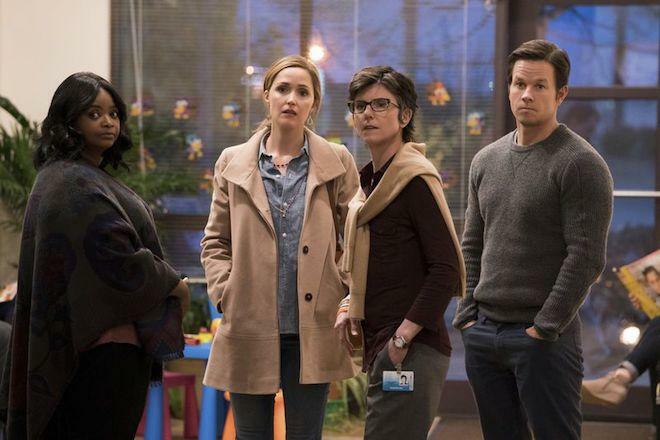 Instant Family comes with an average DTS-HD MA 7.1 mix that under-utilizes the format's capabilities, which isn't a surprise for a dialogue-driven comedy. Dialogue is crystal clear and easy to follow along, even with kids screaming in the background. The directionality of their voices in the house sounds excellent as well. The music score always adds to the comedy and more emotional moments without drowning out any other sound aspect. Rear and surround speakers don't have a ton of traction, save for a few moments where dynamics are bigger -- such as a party, a sports game, and a thunderstorm -- and the low end of bass kicks in and you can hear ambient noises in the background. Otherwise, this is a front-heavy soundtrack. There were no issues with pops, cracks, hiss, or shrills here, leaving this audio presentation with good marks. Instant Family features quite a few bonus materials, all worth your time, including an audio commentary, deleted scenes, gag reel, and more. Audio Commentary - The director Sean Anders and writer John Morris deliver a great and informative commentary track here, about their real-life situations with adoption, casting, editing, making the film, and more. It's worth a listen. Mr. and Mrs. Fix-It (HD, 4 Mins.) - This focuses on Anders' real-life story on him and his wife adopting kids, which was the basis for the film. Kid Power (HD, 9 Mins.) - This looks at the three main kids in the film, the auditions, and their characters. I Need Some Support (HD, 6 Mins.) - This focuses on the characters in the adoption support system, including the funny types of couples and support leaders. Order in the Court (HD, 4 Mins.) - This takes a look at the last scene in the film that takes place in a courtroom. The Families Behind the Fair (HD, 10 Mins.) - There is a sequence in the film where a bunch of families is at a fair, which looks to be real adoptive families. This focuses on their real stories. Crew Inspiration (HD, 5 Mins.) - This examines a real-life foster child who is similar to one of the characters in the film, which is charming. The Anders Family (HD, 7 Mins.) - Another look at the real-life story of the director and his family, where they went through adoption. Gag Reel (HD, 3 Mins.) - Standard missed cues, flubbed lines, laughter, and more from the set. Music Video (HD, 4 Mins.) - Singer Isabel Moner's song "I'll Stay" music video. On Set Proposal (HD, 3 Mins.) - A production assistant on the film proposes to his girlfriend on the set. Deleted Scenes (HD, 10 Mins.) - There are a few deleted scenes, including first family dinner, the first day of school and more, all of which are worth watching. There are optional introductions with Sean Anders and John Morris. When viewing the trailer for this movie, you expect a different, silly film that normally wouldn't be good. Surprisingly though, the film has a ton of heart, emotional impact, and some comedic scenes along with way with some truly likable and realistic characters. Not only that, Anders did a great job in showcasing the ups and downs of the adoption process (and I should know, I went through it). 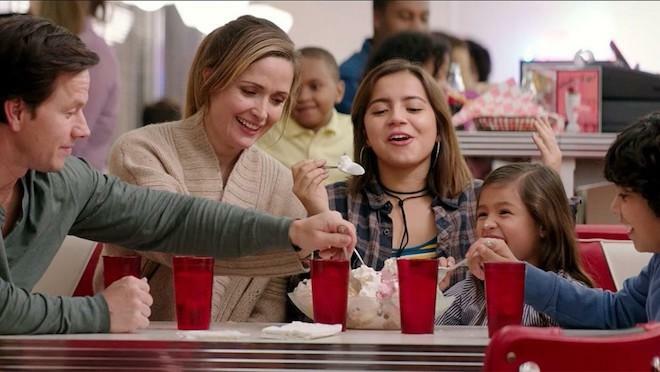 Instant Family is a good film, even though a lot of the story is predictable, but that doesn't take away the entertainment and emotional value of it. The video and audio presentations are both very good and there is a wealth of bonus features to boot, all of which are worth watching. Highly Recommended!